We’d love your help. Let us know what’s wrong with this preview of Eating Clean by Amie Valpone. 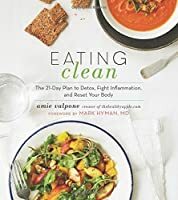 After suffering for a decade from a range of ailments like Lyme Disease, Hypothyroidism, and Leaky Gut Syndrome, Amie Valpone, creator of TheHealthyApple.com, healed herself through clean eating and detoxing. In Eating Clean, Amie provides guidance on how to fight inflammation and reset your body, including a 21-Day Elimination Diet, instructions for food reintroduction, a 2-week meal plan, and an extensive pantry list. The book has over 200 recipes that are vegetarian and free of gluten, dairy, soy, corn, eggs, and refined sugar to keep tummies healthy and satisfied—such as Velvety Pear and Fennel Soup, Carrot “Fettuccine” with Sun-Dried Tomatoes and Pumpkin Seeds, and Vanilla Bean Coconut Ice Cream. With this book, readers are able to get the support they need on their path toward wellness. To ask other readers questions about Eating Clean, please sign up. I picked up this book initially for the recipes. Tons of excellent nutritious ideas for cooking healthy meals at home. The bonus is they are geared toward helping fight inflammation which I find I battle a lot due to my rigorous work out schedule. Lots of information on not only eating but living clean for a healthy body and environment. I can't wait to dig into these recipes! page 28 - if you want to order bread, have a salad instead. (paraphrase). This book is for people who already want to eat clean. It doesn't use science to back up its claims. It's more of a guide for a lifestyle that I'm not convinced I want to partake in. Oh, and saying that eating organic is less expensive than doctor visits in the future is kind of like Marie Antoinette saying "let them eat cake" when the peasants couldn't afford bread. Lots of people take home paychecks that couldn't su page 28 - if you want to order bread, have a salad instead. (paraphrase). I thoroughly enjoyed reading Amie's story of how she healed from multiple health problems through functional medicine and clean eating. The recipes sound delicious, and are accompanied with beautiful color photographs. I borrowed this from the library but placed an order for the book today. I'll definitely be making many of the recipes. I think the author's point of view that food heals (and harms, if you eat the wrong things) is valid, but I find her particular guidelines a bit too restrictive. I haven't tried a lot of the recipes yet (there are many! ), but have tried enough to know...I am buying this book. So far, everything I've made has been delicious! 5 stars for the information in the beginning of the book. 3 stars for the cookbook. Amie is clearly VERY knowledgeable about nutrition, detox, and holistic health. I really appreciated the first quarter of the book that outlined ways to detox your diet, kitchen, home, beauty products, and cleaning supplies, etc. I'll definitely be adopting some of these changes on my own journey to live healthier. The cookbook was impressive and the recipes seemed well planned and explained, but I found most of 5 stars for the information in the beginning of the book. 3 stars for the cookbook. Amie is clearly VERY knowledgeable about nutrition, detox, and holistic health. I really appreciated the first quarter of the book that outlined ways to detox your diet, kitchen, home, beauty products, and cleaning supplies, etc. I'll definitely be adopting some of these changes on my own journey to live healthier. Made several recipes, all very good. This book was full of great information, and wonderful recipes! I'm going to buy a copy to keep! Quick read, good as a reference book. Delicious recipes at the end of the book. A lot of the information I already knew but it’s aways nice to hear about someone else’s story. Love this book, the advice, and the recipes. I took it with on our cottage week and made recipes from it while at the cottage. They were fantastic! Eating Clean: The 21-Day Plan to Detox, Fight Inflammation, and Reset Your Body is a diet that will help to remove toxins from your body. The process is to go on the complete elimination diet and then reintroduce food back into your diet one item at a time. Assess how the new food makes you feel. If you have adverse reactions, then keep that ingredient off of your menu. Essentially the book helps you to identify which foods are toxic to your body and get rid of them so that you can feel better. Amie Valpone, the author, created this diet because of her story of being deathly ill. At one point doctors told her that she only had 24 hours left to live. At 25 years old she weighed only 89 pounds and was malnourished. Her body was not absorbing any nutrients. Furthermore, she had severe abdominal and leg swelling. The doctors did not know what was wrong. After being sent home from the hospital because they couldn't find a diagnosis, Amie had to find her own diagnosis by seeking functional and integrative physicians. They had her do the elimination diet which she describes in the book to determine which foods were toxic to her body. Her diet now is free of gluten, dairy, egg, refined sugar, corn, peanut, and soy. Consequently, she feels "unbelievably better" now. The author starts off with the 21-day elimination diet to remove toxins from your body. She gives thirteen toxic foods to eliminate from your diet. If you cheat by eating something you are not supposed to, you need to start the 21 days all over again. Getting rid of addicting foods will be the hardest part. The first days of the diet you most likely experience withdrawal symptoms such as headaches and feeling lethargic. These side effects will pass within a few days; then you will start feeling energetic and clear headed. Upon completing the 21-day elimination diet, slowly reintroduce organic, healthy foods back into your diet to determine which foods are sensitive to you. Add one food back into your diet at a time to see if you have any reaction to it. After three days of eating this food, assess if you had any reactions. Don't eat the food on the fourth day. If there are no symptoms, then this food can be a part of your diet. However, if you did have an adverse reaction, such as headaches or stomach upsets, then stay away from eating this food. On day five, try another food to introduce into your diet and repeat the process again. Two chapters are devoted to teaching you how to remove toxins from your environment. There are many harmful ingredients in personal care products, cleaning supplies, and pesticides in your home and office, The author tells you where they are and alternative products to use instead. Eating Clean: The 21-Day Plan to Detox, Fight Inflammation, and Reset Your Body describes a strict diet. Hence, it is not for everyone. This book will help people who are sick, even with minor symptoms, to eliminate toxic food in their diet. If you have an ailment that could be caused by a certain food you are eating but cannot find the culprit, this diet is perfect for you. There are recipes on how to make homemade dairy-free nut milk and flours, including almond milk, coconut milk, and almond flour. I enjoyed the recipes because they are easy to make and healthier than the products you purchase at a store. Many websites where you can buy organic ingredients are provided, so you don't have to waste time looking for them in a health store. This book is filled with great vegan gluten free recipes. The whole take on how toxic everything is I take with a grain of salt (organic, natch). By the end, the “everything you eat is terrible and my way is the only way” tone gets annoying. Ich finde das Cover ist sehr ansprechend gestaltet, man sieht direkt diese beiden leckeren Gerichte und bekommt Lust dazu, selbst damit anzufangen mit dem Clean Eating. Ich befasse mich momentan sehr viel mit Ernährung, deswegen habe ich mir dieses Buch auch ausgesucht. 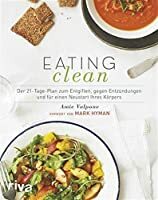 Es ist eine Mischung aus Lifestylebuch in dem Erklärt wird um was es bei Clean Eating überhaupt geht und zum anderen ist es auch ein Kochbuch, mit vielen leckeren Rezepten und Anregungen was man denn alles machen kann. Dazu gehört dann auch noch ein 21 Tage Plan um den Körper zu reinigen, den ich irgendwann sehr gerne mal selbst machen würde. Aktuell habe ich aber leider nicht das Geld dazu, denn das ist das einzige Manko an diesem Buch, man braucht mehr Geld fürs Essen. Die Quinoa spülen, bis das Wasser klar bleibt. In einer dünnen Schicht auf Pergamentpapier streichen und mindestens 1 Std. trocknen lassen. Darauf achten, das die Quinoa vor der Weiterverarbeitung vollständig getrocknet ist. In einer großen Schüssel Quinoa, Mandeln, Pekannüsse, Honig, Zimt, Öl und Salz mischen, bis alles gut vermengt ist. Die Mischung in einer dünnen Schicht auf ein tiefes Backblech verstreichen, das mit Backpapier ausgelegt ist. 20-25 Minuten goldbraun backen. Das Müsli as dem Ofen nehmen, die getrockneten Kirschen unterrühren und 20 Min. zum Abkühlen bereitstellen. Das Müsli mit den Händen in kleine stücke brechen. Die Müslistückchen pur oder mit einer Schüssel mit Mandelmilch und frischen Beeren servieren. Das Müsli ist in einem verschlossenen Behälter 5 Tage haltbar. Amie Valpone, hat es geschafft, sich nach Jahren chronischer Krankheit selbst zu heilen. Amie kocht mit biologischen und entzündungshemmenden Lebensmitteln für eine Vielzahl von Kunden, m auch für berühmte Persönlichkeiten. Dr. med. Mark Hyman ist Leiter des Cleveland Clinic Center for Functional Medicine, Vorsitzender des Institute for Functional Medicine sowie Gründer und ärztlicher Direktor von The UltraWellness Center. Außerdem ist er der Autor zahlreicher New York Times-Bestseller, darunter Hoher Blutzucker – übergewichtig und mangelernährt und Die Megabolic-Diät. Ein tolles Buch, das mir sehr geholfen hat mit meiner Ernährung. Ich kann es allen weiterempfehlen die eine gesunde Ernährungsweise pflegen (möchten). I originally picked up this book for the recipes, but I love the storytelling and sound advice. Solid information in this book. I did take away a few good tidbits. Unfortunately if you're low income it's depressing to read about all the things that can make you sick, but you can't afford to replace or to buy the more expensive alternative (food, household items, etc). Most of the recipes aren't very feasible for the typical American who works full-time, has kids, and doesn't have the time to cook everything from scratch. Amie Valpone, like so many other healthy cookbook authors, found herself in poor health and after exhausting all of the medical possibilities, turned to healthy food to heal herself. What sets this book apart is her honesty, really good basic instructions for those new to cooking, delicious looking recipes and photography which highlights the recipes. I checked this book out of the library, but I'll be purchasing it as soon as possible. It had a lot of good, solid information. Unfortunately, much of it I already knew. The biggest disappointment for me was not having a picture for every recipe. The majority were time consuming and just not very practical for a busy mom of 6. Lots of helpful information and the author's personal story of healing herself largely through changes in her own diet was fascinating. Some really good recipes. I would have preferred to see a photo of each recipe. Many of the recipes are quite complicated requiring many ingredients or a lot of time soaking things or are otherwise labor intensive. I love the introductory information and the appendices. I have a simpler taste for recipes and did not find that recipes added much to what I like to prepare. 1/2/17 on sale for $2.99.